*** Thank you very much for your contribution! Submission is expired. The Organizing Committee of HKAECT 2014 cordially invites you to participate at the next HKAECT Conference 2014 on “Communication and Education: New Media, Knowledge Practices and Multiliteracies”. New media appear both with multimedia presentation elements and interactive knowledge units which call for emergent knowledge practices. All these multifaceted ways of communication require the ability to understand multiliteracies in terms of culture, disciplines, media and technology. We are calling papers to discuss new media, emergent knowledge practices and multiliteracies in three main aspects: (1) Communication; (2) Education, and (3) Technology. The Conference will include keynote addresses, paper presentations, tutorials and workshops. We welcome theoretical papers, reviews, empirical research reports, case studies, best practices, demonstrations, solutions, and experience sharing. All submissions should be written in English, of a length within twelve A4 pages, including title, abstract, introduction, study method(s), results, discussion and references. Each submission will be peer-reviewed and acceptance will be based on the paper quality. All accepted submission will be published in the local Conference Proceedings. Authors of accepted papers will be invited to present their work at the Conference in English. *In the first stage call for participation (submission expired by May 15, 2014), all accepted submissions are included in the HKAECT 2014 International Conference Proceedings, published by Springer. 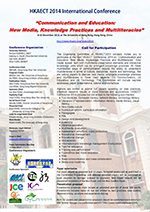 The HKAECT 2014 International Conference is seeking reviewers for constructive analysis of papers. The role is unpaid but this academic community contribution will surely be a meaningful job. Interested parties please send a brief CV with your expertise areas (maximum 2 pages) to the HKAECT2014 Program Chairs (hkaect2014@gmail.com). Thank you for your support.